Participants compared notes about working with farmers versus the private sector or government, and which ICTs have been successful or not. Most participants agreed radio has the greatest resonance with farmers, because 65 percent of Ethiopians own radios compared to 24 percent mobile phone penetration. Some initiatives use a multi-channel approach, that may include radio programming in combination with SMS reminders to do x,y,z, or notifications about prices or weather conditions. Most of the successful ag initiatives are small, and the current challenge in Ethiopia is bringing successful programs to scale. Participants working in the public and private sector said the biggest challenge for improving agriculture in Ethiopia is scale. Everyone working in the space is trying to figure out how to increase reach for the current small but successful programs. Organizations are strategizing how to increase awareness of programs and also convince farmers to adopt best practices. 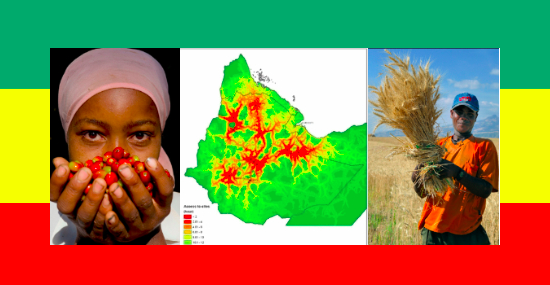 Ethiopia has the highest number of extension agents per capita in the world, and the government is the main provider of farming supplies such as seed and fertilizer. One discussant advocated for organizations to address the government’s supply and delivery system rather than doing farmer-facing projects. Unfortunately there are not many incentives in the government system to promote efficiency for deliveries, and farmers suffer because of this. Many problems farmers encounter can be contributed to inefficiencies in the government system, and late deliveries, bad product etc. affect their growing windows. In the future of ag in Ethiopia, farmers need better access to supplies to improve production. Many of the ag initiatives mentioned such as iCow, Shamba Shape-Up, Farm Radio International and digitalGREEN are funded by donors. Participants discussed how this leads to lack of sustainability for projects. One participant said one opportunity to increase sustainability is to partner more with the Ethiopian government, because the government controls so much of the supply system. By partnering with the Ethiopian government, organizations can address the systems that often create problems for farmers, i.e. late deliveries, delivery of bad product, etc. One discussant said the private sector must be involved to create more sustainable ag programs. In Ethiopia, the private sector has been crowded out by the government and funders, and prohibited more entrepreneurial growth. ICT may not be the silver bullet in Ethiopia. Although after the June Tech Salon discussion it’s evident that there are already many ideas among ICT4Ag leaders to help farmers get better access to supplies and bring successful programs to more farmers.